Duratop Epoxy is a solid cast, monolithic epoxy resin, molded and oven-cured as a solid, uniformly constructed product, with smooth, nonspecular and non-glaring finish, offering excellent quality laboratory work surfaces and complimentary sink units. Produced at the ISO 9000 Certified manufacturing facility at the Durcon, Inc. plant in Taylor, Texas, and private braded by Durcon for Total Lab Solutions under the label Duratop Epoxy. The impressive heat and chemical resistance of solid cast epoxy resin makes Duratop Epoxy the most popular choice for the rigors of a laboratory environment. The outstanding qualities of epoxy resin provide the safest, most economical and long-lasting work surface available. 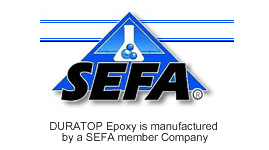 DURATOP epoxy laboratory countertops are asbestos free and a LEED qualified material. Epoxy resin surfaces resist discoloration, blistering, and cracking even under the harshest conditions. This extremely high chemical and heat resistance means DURATOP cast epoxy work surface and components, with proper maintenance procedures, will look like new after years of hard work in the laboratory or scientific environment. Solid cast Epoxy work surfaces or lab tops do not depend on surface coating for protection or use low cost core material. Their strength and durability are built right into each sheet or sink. The smooth, matte, medium to low-sheen, non-glare finish eliminates distracting glare or light reflection and is easy to maintain. Duratop Epoxy is in compliance with Woodworking Institute (W.I.) section 18. Epoxy Resin products are typically specified in sections 12 3600 Counter Tops and 12 3653 - LABORATORY WORKSURFACES in Division 12 specifications. Cast epoxy materials have recently come to be described by some specifiers as "Solid Surface Fabrications", describing the material as "cast, nonporous solid surfacing material composed of homogeneous modified epoxy resins". Flexural Strength: Not less than 10,000 psi. Insul-Serv, Inc, dba TLS (Total Lab Solutions) is also a CCR (Central Contracting Registry) registered and approved supplier for GSA, VA Dental and Hospital projects, military, VA Hospitals, foreign based educational facilities. Please use the following website for details: https://www.bpn.gov/ccr/default.aspx. As a proud veteran of Viet Nam military service in the Army Medical Corps, our company representative is pleased to be a supplier to the US Military at home and abroad and our products comply with the Buy American Act of 2009, which as amended calls for minimum 50% of material content to be made in the USA. This SIN includes general- purpose laboratory furniture such as cabinets, tables, sinks and work surfaces. Includes cabinets, cases, lockers, chemically resistant work surfaces, tables, sinks and other laboratory furniture designed to be installed into group configurations where installation, removal and relocation is required without disturbing adjacent components. Wall mounted or free standing cores, rails and panels provide support structures for workstations where flexibility in the installation and arrangement is required. 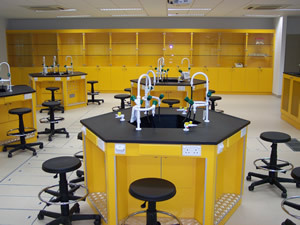 This SIN includes general-purpose free standing laboratory furniture such as cabinets, tables, sinks and desks. This SIN also includes portable workstations and carts for the transportation and storage of laboratory equipment. Free standing laboratory furniture, mobile ovens, cabinets, benches and instrument carts, with chemically resistant work surfaces. Laboratory sinks, cup sinks and related plumbing fixtures. Free standing laboratory base wood cabinets and base metal cabinets with drawers, hinged doors and adjustable shelves. Mobile work benches, chemical workstations with pipeting drawers, storage and seating areas. Self contained casework and task workstations. Fume hoods are available for nonmedical applications such as processing corrosive chemicals, explosive and radioactive substances. Laboratory fume hoods include bench-top, floor consoles or walk-in models with variable air volume, constant air flow designs; stainless steel perchloric acid hoods with built-in wash down systems, stationary and portable hoods, radio isotope hoods and glove boxes are available.